We take feet very seriously at Bespoke. This is why we offer a range of services dedicated to this area be it choosing the correct shoes, custom moulding shoes, getting custom insoles or getting your cleats perfectly aligned! 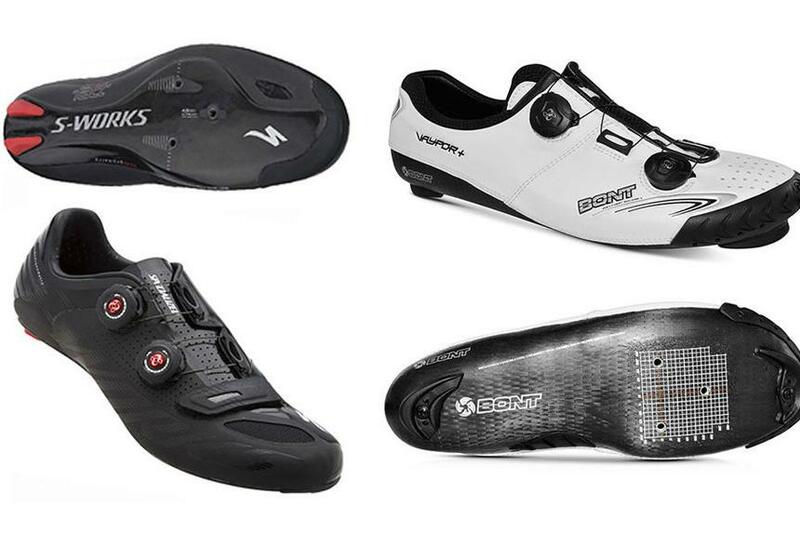 People that are new to cycling often buy cycling shoes that are a size too big as they are used to having more room in their training shoes. I have also seen people that have wide feet, but who like the look of narrow Italian shoes, go for a size bigger to compensate. This can lead to issues with correctly positioning the cleat on the shoe. 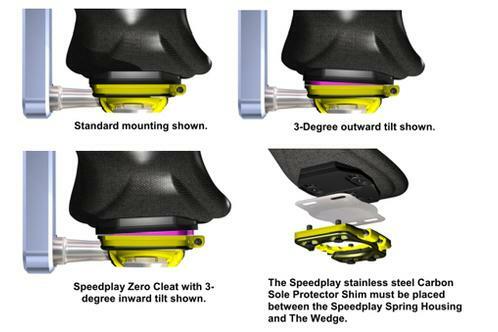 Cleat placement fore/aft is very important because it affects which part of the foot is loaded during the power stroke. If the cleat is too far forward, you will load the toes which can often lead to reduced power production and increased strain to lower leg muscles. To gain maximum leverage without loading the toes, I position cleats so that the pedal axle lies under the first and second metatarsals (balls of the foot). This is the same part of the foot you would load during a hop. 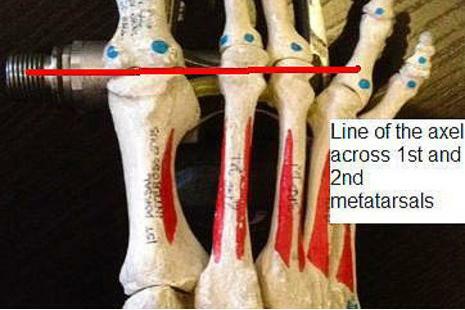 I am looking for the forces to run a straight through down through the foot and create a straight line of force that could be drawn through the middle of the knee, middle of the ankle and 2nd metatarsal (base of the second toe). Concentrating on pushing through the second ball of the foot and relaxing your toes helps this process. 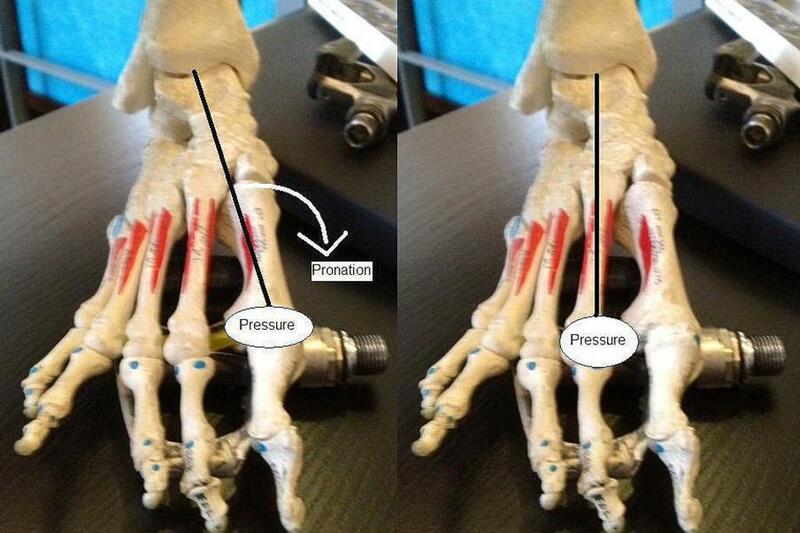 Pushing through the first ball of the foot causes the line of force to track towards the inside and can cause pronation (dropping of the arch of the foot). When shoe manufacturers design shoes, they drill the cleat holes roughly where the balls of the feet should be for that size of foot. If you use a pair of shoes that are a size big, the cleat holes will be further forward, which often makes it harder to correctly position the cleat. In the same way that people have different distribution of length between the legs and the body, people have differently proportioned feet (long toes and short metatarsals vs. short toes and long metatarsals). It is especially important for people with long toes and short metatarsals to not use shoes that are too big as the balls of the feet are already further back. Sometimes it's impossible to perfectly position the cleat fore and aft due to abnormal distribution of foot length or strange placement of the cleat holes. In this case, I would strongly suggest changing to Speedplay which offer significantly more fore/aft adjustment than any other manufacturer. If even more adjustment is needed, I'd be looking to drill new cleat bolt holes in the shoe. Other aspects that need to be taken into consideration are thing like leg length differences (which can be corrected with shims), as well as forefoot and rearfoot angulations which can be corrected with wedges. The arch support in the shoes is also very important. We want your foot to act like a solid lever (we don't really want your foot to be a foot). In running, the foot pronates (dropping of the arch) which absorbs the energy of the foot strike, stores it as elastic energy and then releases it like a spring on toe off. In the pedal stroke, the only time that energy will be released is on the up stroke which will push back against the pedal. Therefore, supporting the foot in a neutral position is very important. 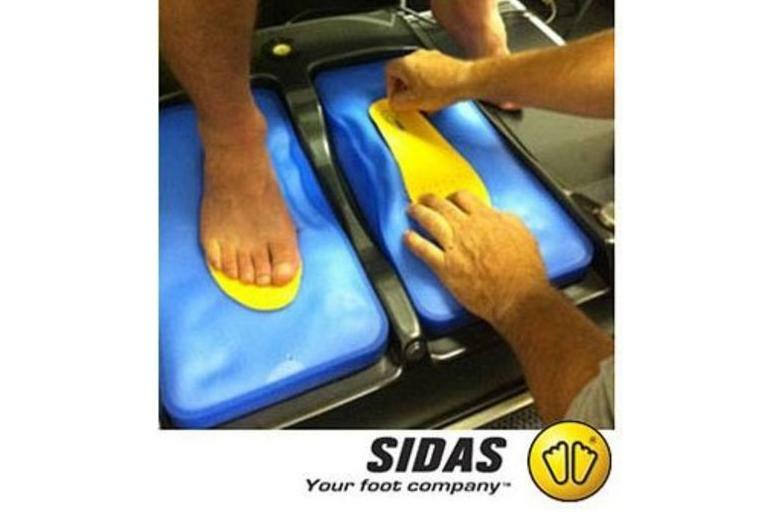 This can be achieved with either a generic product like the BG footbeds or we can produce full custom footbeds that mirror exactly what each foot requires. Cycling shoes should be snug. When trying shoes on in the shop, you don't want to have your toes against the end of the shoes or the sides uncomfortably squeezing the feet. But visa versa, you don't want the shoes to feel roomy. You want 3-5mm of room at the endhttps://www.bespokecycling.com/refinery/blog/posts/the-importance-of-correct-fit-for-cycling-shoes/edit to allow for thicker socks. Hold the back of the shoe and check that your heel doesn't move when you gently pull up. If you know that you have wide feet, try something like a Bont Vaypor Plus which comes in a specific wide fit. Bont are also heat mouldable for a custom fit. Call us to find out more about our full foot consultation which will take into account all of these aspects and see our range of premium cycling shoes in store.